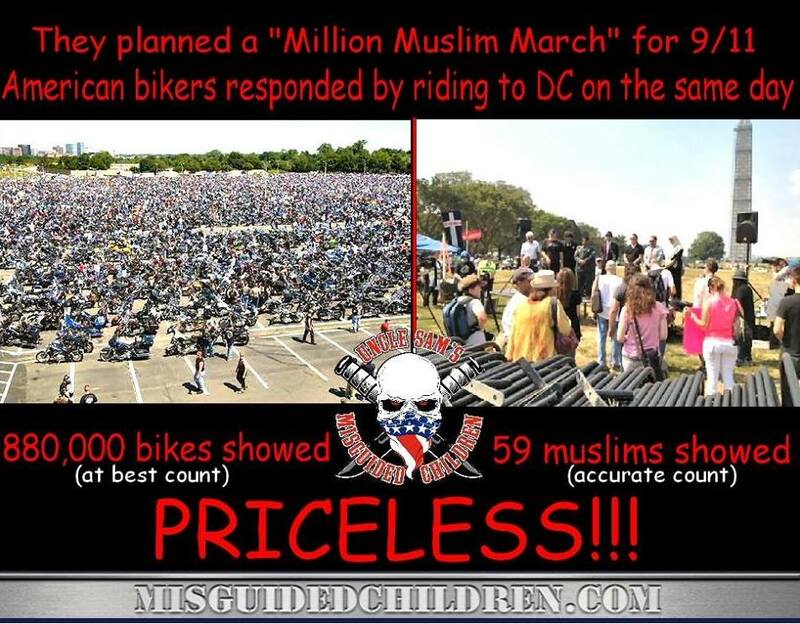 2 million bikers’ roar over Muslims in D.C. But at noon Wednesday in the nation’s capital, there weren’t a million Muslims or Americans to be found anywhere – not even close. In fact, a WND-TV news crew on the scene, preparing to provide live coverage of the event in a webcast, was unable to locate any of the marchers who were supposed to go from the National Mall to the Supreme Court and the White House. Mark Segraves of the NBC affiliate in Washington reported that only “about 25 people,” including activist Cornel West, were at the Muslim march as of 12:30 p.m. Wednesday, with a group of Christians about the same size nearby. However, the counter-protest by bikers was in evidence everywhere. Driving in from Canada and all over the United States, the bikers, who were denied a permit for their demonstration, were flooding the capital. 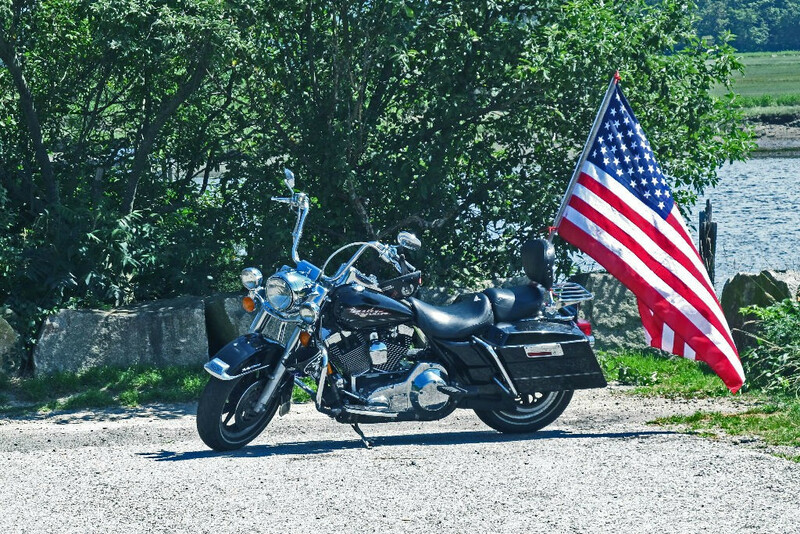 At approximately 1 p.m., “2 Million Bikers to DC” Facebook page co-founder Belinda Bee posted that police have counted nearly one million bikers are on the streets of Washington. In fact, The American Muslim Political Action Committee was criticized for scheduling the march on the anniversary of 9/11. Many non-Muslim Americans are terrified of Muslims, who are portrayed by Hollywood and the US media as fanatical terrorists. Muslims, too, live in fear – of being dragged off in the night to Guantanamo and tortured, simply for the crime of being Muslim in the wrong place at the wrong time. September 11th, 2001 was the beginning of a new era of fear. Since 9/11, Americans have been terrorized by the media. Organizers at the group American Muslim Political Action Committee (AMPAC) didn’t exactly do a lot to engender sympathy for an event held on one of the most emotionally charged days of the year. The group is led by M.D. Rabbi Alam, a professed 9/11 truther who has pushed controversial anti-Semitic conspiracy theories about the attacks. AMPAC’s plans outraged conservative outlets earlier this year, though many cited the religion of the organizing group, rather than the fringe beliefs behind the event. The bikers, meanwhile, have stated their opposition to President Obama’s push to “fundamentally transform” the U.S.
Radio giant Rush Limbaugh said Wednesday the American public as a whole did not understand what Obama was intending to do when he campaigned in 2008 with that remark. There is a major difference in the Facebook pages for the two 9/11 events. The Million American March Against Fear page has a paltry 295 Facebook likes, and has not posted any photos of their rally as of 2 p.m. But on the 2 Million Bikers to DC Facebook page, there are 196,000 likes, and many photos of the bikers rolling into the nation’s capital. Oh! “59” showed up? I heard it was 11.